I cut out various sized rectangles of random fabrics still in this color family, and turned the two short ends down on the machine. 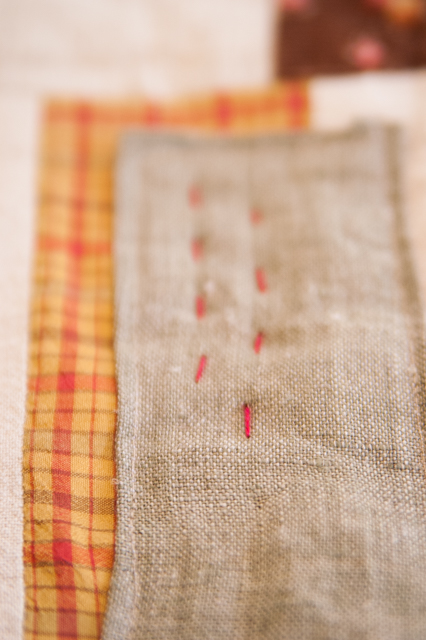 Then pinned the patch in place and machine-stitched it down on all four sides. I made no attempt to disguise the fact that these were patches, because I like the way the blocks look appliqued on unexpectedly. Afterwards I did a few running stitches in red perle cotton just for fun--they're not functional. 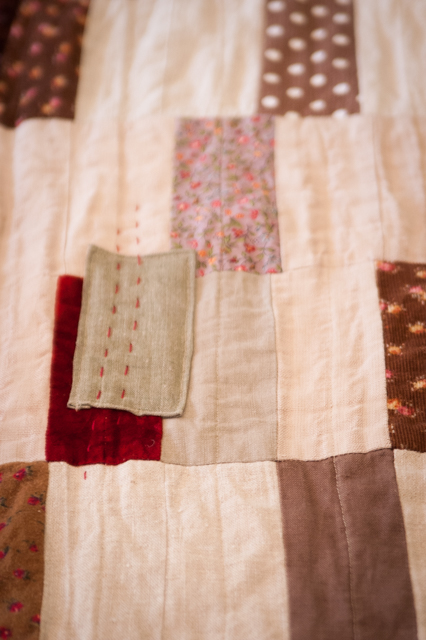 For some reason, patching this quilt was such a happy job. I rarely get to sew for my boys. These are the kind of patches I like. And the stitching is such a cute idea. Patching seems appropriate for a patchwork quilt! I'm sure Giles will be delighted with his refurbished quilt. Thanks for sharing the "after" process. We appreciate you helping us continue the quilt making joy.